The ENPlus Certificate is a European-wide quality standard for wood pellets. This standard guarantees that the pellet meets certain minimum performance parameters such as calorific value (CV) and ash content. For more information on ENPlus, please visit the UK Pellet Council website. The CV is the amount of energy a tonne of pellets contains and is measured by a controlled laboratory test. The ENPlusA1 standard demands at least 4,600 KWh per tonne. Our confidence in Woodlets enables us to guarantee a minimum of 4,800 KWh of heat per tonne. We can deliver this because of our strict in-house quality programme where the CV of Woodlets is tested regularly and verified by an independent laboratory. 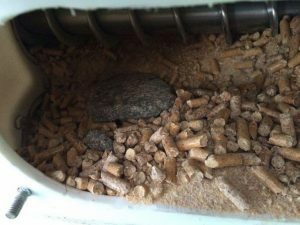 The quantity of ash is also set by ENPlus A1 at <0.7% allowable ash per Kg of pellets burnt, which translates into a typical household generating 35 Kg of ash for 5 tonnes of pellets burnt. Woodlets have an average ash content of <0.2%, therefore generating an industry wide low of 10kg of ash for every 5 tonnes burnt. Pellet samples are tested to ensure we maintain this standard. Check our results from an independent laboratory on our blog page. When considering other makes of pellets, put them to the test and ask the suppliers for their CV and ash content certificates. How can you recognise a bag of poor quality pellets? If your bag does show signs of the above, you should contact your supplier as their quality is questionable.